The firm will cover the cost of mutual fund fee rebates to retirees and charities, rather than having advisors do so. CEO Paul Reilly at a recent advisor conference. Raymond James (RJF) has reversed a decision that would have required some advisors to cover fund fees and charges being refunded to clients after getting pushback from advisors. 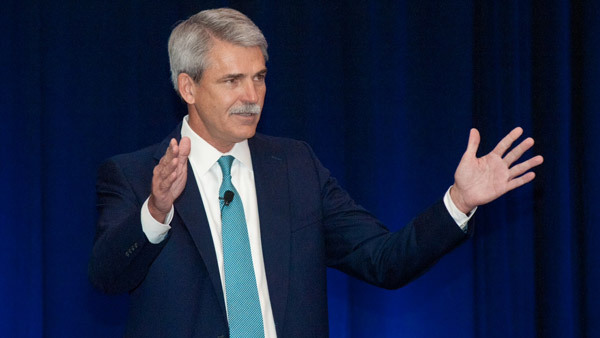 “After continued dialogue with advisors, Raymond James will absorb the cost of mutual fund sales charges and fee rebates to clients with eligible retirement plan and charitable trust accounts, and not require advisors to return commissions received on the mutual fund purchase transactions,” the firm said in a statement shared with ThinkAdvisor on Tuesday. Last week, Raymond James said some advisors would be required to refund certain fees associated with these fund sales. It said the refunds affected less than 1% of client accounts and that the median rebate would be roughly $200. The firm recently sent a memo to branch managers and advisors to outline its policies going forward, after recognizing a $10.5 million adjustment associated with fund commissions in its latest quarterly earnings report. Raymond James shared a similar view in its extended statement on the matter. “Given the complexities of the subject – including policy variations among fund companies, lack of clarity in prospectuses and a gap in the industry’s and Raymond James’ abilities to systematically identify waiver availability, we felt this [new policy] would be the best way to limit distraction for advisors and minimize confusion for clients,” it stated. With the news that the overlooked waivers now will be covered by the firm and not the advisors, Raymond James is poised to put the matter to rest, experts say. — Check out Raymond James FAs to Refund Some Fees to Retirement Plans, Charity Trusts on ThinkAdvisor.